Toyota will be having the world debut of five new Toyota vehicle concepts at the Tokyo Motor Show, which include the Fuel Cell Vehicle (FCV) concept. 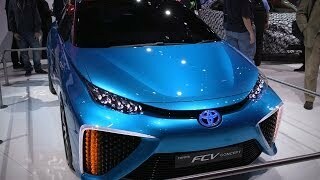 The Toyota FCV Concept gets a progressive refinement of hydrogen fuel cell technology which gives a range of at least 300 miles (500 km) on a full tank and a refueling time of just around 3 min. 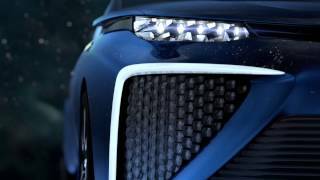 The FCV Concept’s exterior design expresses the key characteristics of a fuel cell vehicle. The front end features pronounced air intakes, while an air-to-water theme is captured in the flowing liquid profile of the doors, a wave motif on the filler cap and a rear-end treatment inspired by the stern of a catamaran. 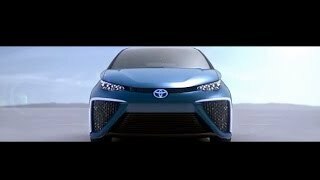 The model features Toyota’s proprietary compact and lightweight fuel cell stack and a pair of high-pressure (70mPa) hydrogen tanks. 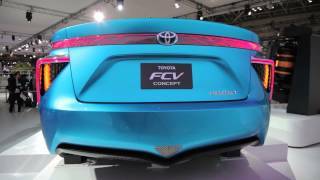 The Toyota FC stack has a 3kW/l power output density, which is more than twice that of the system previously used in the FCHV-adv concept, and a maximum power output of at least 100kW. It is also equipped with a high-efficiency boost converter.